Mack Brush Series 72 Long Bob Pinstriping, Scrolling and Sign Painting Brushes. Buy Available in Sizes 000, 00, 1 and 2, This brush is a new offering from Mack Brush. It is a modified version of the Bobbo Super Quad. Mack used the same mixture of hair that is offered in the Bobbo, which is a black synthetic and blue squirrel blend, BUT with extended hair lengths of 1-3/4" to 2". Mack has had great success with the Bobbo brush, and had requests for a longer hair version. 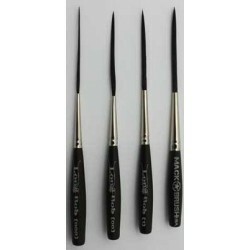 Mack offers this brush in 4 different sizes which are 000, 00, 1 and 2. With the mixture of hair that is used, this provides medium versatility for enamels and well as urethane's without compromising performance. The smaller sizes offer intricate design work capabilities coupled with very tight cornering. As you progress to the higher sizes the brush will allow you to do longer line work with thicker consistent line quality. These brushes will offer the individual a high quality pin-striper, out-liner and scroller. Individual Brushes LISTED BELOW! Long Bob Scroll Pinstriper Size 00 Series LBBuy Mack Brush Series LB Size 00 Long Bob Pinstriping and Scrolling Brush Hair Length 1-3/4" - 2"This brus..
Long Bob Scroll Pinstriper Size 000 Series LBBuy Mack Brush Series LB Size 000 Long Bob Pinstriping and Scrolling Brush Hair Length 1-3/4" - 2". This ..
Long Bob Scroll Pinstriper Size 2 Series LB Buy Mack Brush Series LB Size 2 Long Bob Pinstriping and Scrolling Brush Hair Length 1-3/4" - 2" This brus..
Long Bob Scroll Pinstriper Size 1 Series LB Buy Mack Brush Series LB Size 1 Long Bob Pinstriping and Scrolling Brush Hair Length 1-3/4" - 2". This bru..